Chinese water-ink painting, brighter Western watercolors and delicate porcelain are curiously integrated in the works of American artist Philip Read, making him a focus of attention at a ceramics fair in China’s porcelain capital of Jingdezhen. Attracted by the art of ceramics, Read has been living in Jingdezhen in central China’s Jiangxi Province for the last four years. It is the third time he has brought his artworks to the annual event, which runs until Wednesday of October 22. “I have a studio here and I also teach making ceramics,” said Read, one of a number of specialist foreign artists plying their trade in a city that has been producing quality pottery for around 1,700 years. “I own another studio in New York, but my works are much more popular in China, for their style is more Chinese than Western, which can be better understood by the Chinese collectors,” he explained. Thirty years ago, Read, who was then a watercolor painter, started to learn Chinese water-ink painting, and from then on, he gradually developed a unique style that combines the techniques of the two types of painting. About 20 years ago, a trip to Jingdezhen introduced Read to the world of ceramics. “Before that trip, I was not that interested in ceramics, but after I touched the material, I realized how magical and special it was. From that point on, I started to get more and more involved in ceramics,” he said. The fair has attracted companies and artists from 35 countries and regions. 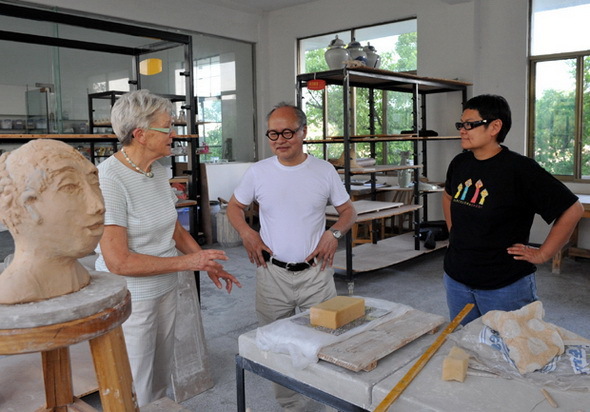 Like Read, Dutch artist Adriaan Rees has also made his home in Jingdezhen. 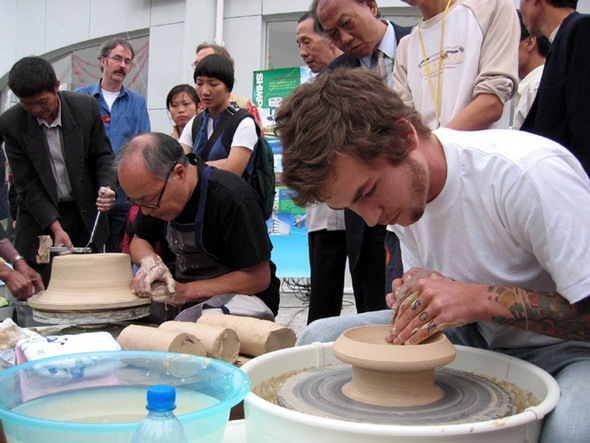 “For the past seven years, I have been partly living in this city, making ceramics and promoting exchanges between artists in Jingdezhen and Delft, which is the ceramics capital of the Netherlands,” he said. Rees is the organizer of the World Ceramic Road, an alliance of 17 European and Asian cities which are specialized in the pottery industry. “The member cities are encouraged to exchange their ideas and techniques,” he said. The fair has also attracted exhibitors from Japan and the Republic of Korea. Kutani ware, a style of porcelain from Japan, has been drawing attention with its exquisite craftsmanship. According to Chinese sales agent Yuan Jiangping, Kutani ware has a history of more than 300 years, and all the products are made by small workshops in Kutani Village. “It is known for using multiple colors and gold leaf printing,” he said. It is the 11th time Kutani ware has been displayed at the fair. “More and more Chinese people are getting to know this Japanese brand, and our sales volume in China is growing year by year. Now, our annual sales volume here is more than 100 million Japanese yen (933,400 U.S. dollars),” according to Japanese ceramics maker Nobuyuki Shimazaki. Zhang Lingyun is 40. 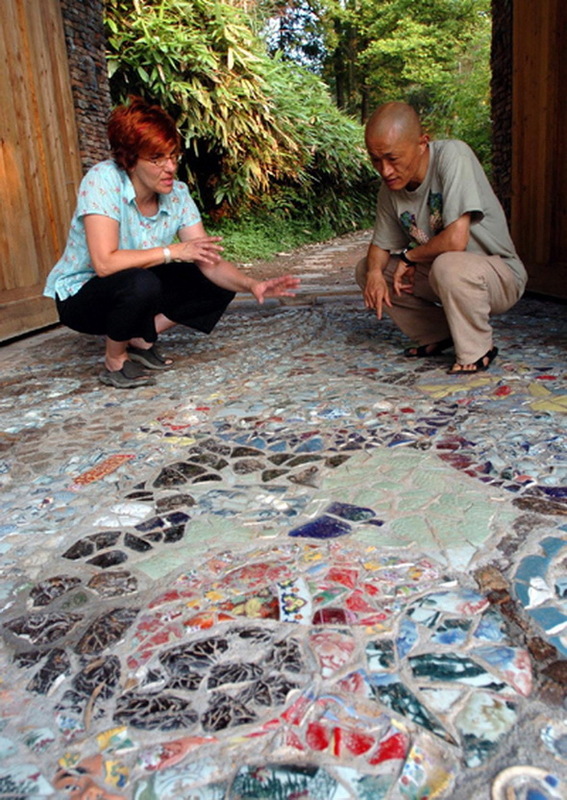 It’s been 20 years since the ceramic artist came to Jingdezhen, China’s “porcelain capital”. Zhang’s story with ceramics had a random, romantic start: she knew barely anything about ceramics before she came across the name “Jingdezhen Ceramic Institute (JCI)” when applying for college. “Ceramics sounded interesting so I filed the application for JCI.” The whim of impulse had made great difference in Zhang’s life. Hands and flames are the catalysts of Zhang’s love for ceramics, as studios, factories and field workshops are their places of rendezvous. Gradually, she had gained mastery in the artisan-porcelain relationship. Zhang’s works have won awards both at home and abroad, many of which became international collectibles. The blue-and-white porcelain lamp posts designed by her now decorate a road near the city hall of Delft, Holland. She had also visited many foreign countries. “I like different ceramic cultures, which provide me with inspiration. I also like to observe the subtlety and delicacy of the daily life, which help me improve my artistic creation,” she said. Zhang is an associate professor at JCI, her alma mater, offering courses in blue-and-white porcelains, porcelains for daily life, ceramic environmentalism and ceramic designing. Occasionally, she invites students to discussions at her residence, expecting thoughts and insights that may not occur in common classes. At present, Zhang is also preparing for her own ceramics gallery, “Yun Space”, which is about to be ready later this year. Once “Yun Space” is launched, there will be regular international ceramic exhibitions and scholarly lectures. “I hope visitors to ‘Yun Space’ can update their perception of the ceramic art and see into its great possibility,” she said. Let’s share more info !!! At the ongoing international ceramic fair in Jingdezhen, a new type of porcelain has been lauded by experts and visitors with its jade-like smoothness and translucency. The jade-like porcelain was newly developed by Jingdezhen Porcelain and Jade Research Institute. According to the head of the institute Huang Sheming, the clay of such porcelain is mixed with jade powder, giving it its appearance. The new composite was first produced in August. “We have spent about 10 years in developing such a new material,” he said. Currently the main products made of this material are porcelain plate paintings and tableware. “Real jade cannot be painted since it cannot withstand high temperature and colors cannot be burned onto it. Patterns and designs can only be carved into the jade wares, while the creation of this jade-like porcelain has helped realize the combination of the beauty of jade and painting,” he said. “The firing of the jade-like porcelain has a low success rate, so its price is high comparing to other kinds of porcelain, according to Huang Sheming. 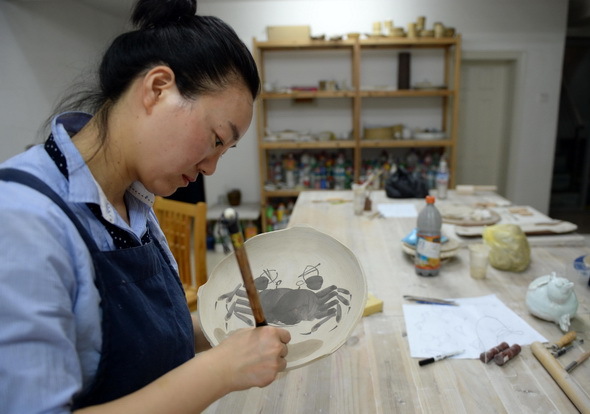 The first online ceramic art design copyright trading platform in China was officially launched on Monday in the country’s “porcelain capital” of Jingdezhen. Individuals or businessmen can use the platform to select and buy the copyright from artists’ various design works displayed on the portal’s website. It was developed by Jingdezhen Ceramic Institute in east China’s Jiangxi Province, to promote the sound development of the porcelain industry. Porcelain designs for daily use, sanitation and art are available on the website tcxycxy.ccmall.cn. The opening of the platform is aimed at helping build a healthy ceramic market by protecting the works and rights of designers and encouraging their innovation enthusiasm, said Guo Li, an official of the institute. With a porcelain producing history of 1,700 years, Jingdezhen has attracted an increasing number of porcelain art lovers in recent years. Yet plagiarism is common in the industry due to local poor awareness of intellectual property rights protection and law enforcement. An online database listing detailed information of Chinese ceramic art works was launched on Monday in Jingdezhen City, east China’s Jiangxi Province. Jointly built by Chinese art works authentication recording center under the Copyright Society of China and Jiangxi entry-exit inspection and quarantine bureau, the database has collected such information as the microscopic structure, chemical constitution, physical performance, and three-dimensional pictures of different ceramic crafts. Art collectors and appraisers can log on the database’s website http://www.ccloudb.com for reference when trying to identify the authenticity of a ceramic work. The database is expected to help regulate the trading market of ceramic crafts, and protect the intellectual property of ceramic art works. So far, the database has 90 items. Developers of the database are striving to expand the offerings by inviting more ceramists and collectors to have the information of their art works collected.